Description: You may think you are on a farm when you see this white wooden realistic chicken. The Cacklin Hen proudly flaps her wings and says, "cluck, cluck, squa-awk" as she is pulled. 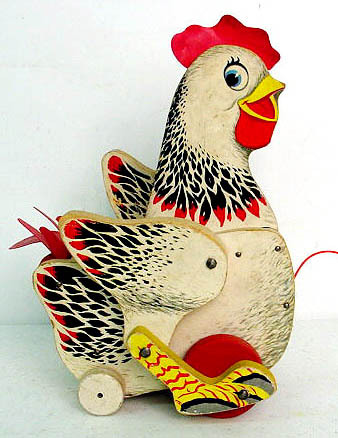 FPT4051 - Wooden cut out chicken with colorful paper lithography attached to the sides of a chicken with white, black, and red feathers, blue eyes, and a yellow beak. 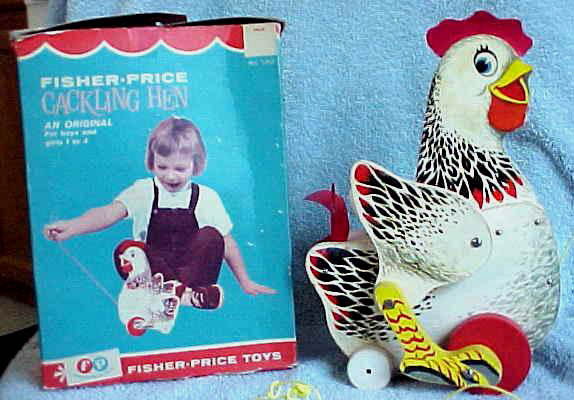 Hen has a red plastic tail and crown feathers and she rolls on 4 wooden wheels. Her "feet" are attached to the 2 front red wheels and when she rolls, her feet, which are also attached to her wings, make her wings flat. Feet and wings are wooden cut outs with paper lithography attached that match the body feather color. She measures 6-1/2" long, 10" high, and 5" wide. 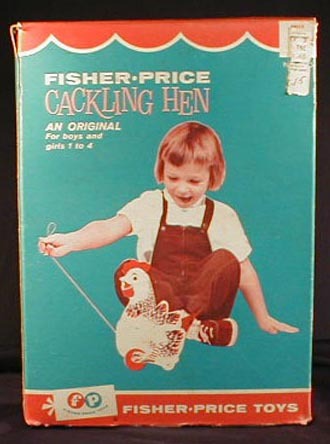 Also see 1966's #123 Cackling Hen. Also see 1954's #140 Katy Kackler.